At a press conference held at the headquarters of the Opposition People’s United Party (PUP) in Belize City on Tuesday afternoon, Opposition Leader Francis Fonseca said that Prime Minister and United Democratic Party (UDP) leader Dean Barrow is ultimately responsible for the passport and visa hustle which has been happening under his administration—a scandal which the Opposition notes broke 26 days ago, still with no resignation by the former Minister of State for Immigration Elvin Penner, as the member of Parliament representing Cayo North East, against whom they are seeking a recall vote. Earlier today, Barrow publicly announced that Penner should resign from the UDP or face recall, although there are allegations from the PUP camp that the UDP has been threatening persons to withdraw scholarships and social aid if they were to sign the recall petition. “Let us not forget that it is Prime Minister Barrow who we must hold responsible for this matter. It is Mister Barrow who was negligent and reckless in purporting to confer authority on Mister Penner, giving him the power to sign nationality certificates. For him to say, as he did last week Thursday – for him to say that he will regret this decision to the end of his days is just empty, false, self-serving rhetoric. The evidence was clear: He knew Mister Penner’s weakness. He knew the man’s weakness and yet he facilitated that weakness. Barrow must be held responsible,” Fonseca said. The Opposition Leader said that he is satisfied that Barrow had no constitutional authority to confer that authority on Penner and he goes further to ask Barrow to disclose any legal opinion he claims to have to support what he did. He said that it was not only the PUP, but also the media, which documented Penner’s abuse of immigration and nationality procedures taking place during the elections, and it was Barrow’s decision and his alone to appoint Penner to be responsible for the Immigration Department; “…and we must forever hold Barrow responsible for that,” Fonseca said. Fonseca also called for the substantive Minister of Immigration, Godwin Hulse, to also resign, noting that as head of the ministry he cannot be leading an investigation into the passport scandal. “The Prime Minister’s admission that he warned ministers… (Whenever he has a problem he likes to hold his head.) He held his head in his hands and said, ‘I warned the ministers about ministerial visa hustling.’ He warned them about it, but what did he do? What did he do? “He did nothing to investigate it. He did nothing to stop it and this is very important, because it simply exposes what every right-minded Belizean knows to be true – that many, many of these UDP ministers, notwithstanding their righteous pretentions… but so many of them are just pigs eating at the public trough! Eating out our public funds and abusing our system of governance,” Fonseca added. 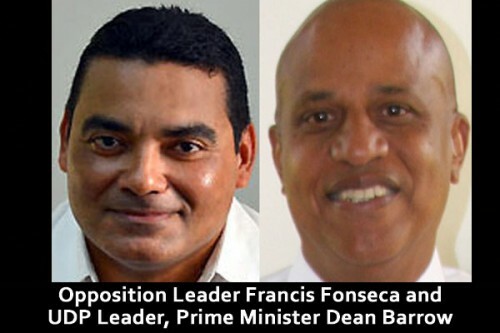 Fonseca issued a call on the law enforcement authorities to report to the Belizean people on the progress of their criminal investigations involving Penner, Belize City Councilor Eric Chang and all others allegedly involved in the passport scandal. He also called for an audit of how many passports were sold and to whom, asking the Prime Minister to report on the results of the audit to the Belizean people. Fonseca added that since the Government is engaged in a cover-up, there must be an independent senate inquiry into this matter. “They have together, collectively bastardized and cheapened our nationality by selling our Belizean identity… They have sold our national identity to criminals and international terrorists,” Fonseca said.